A classic treat from childhood, but still perfectly delicious at any age! 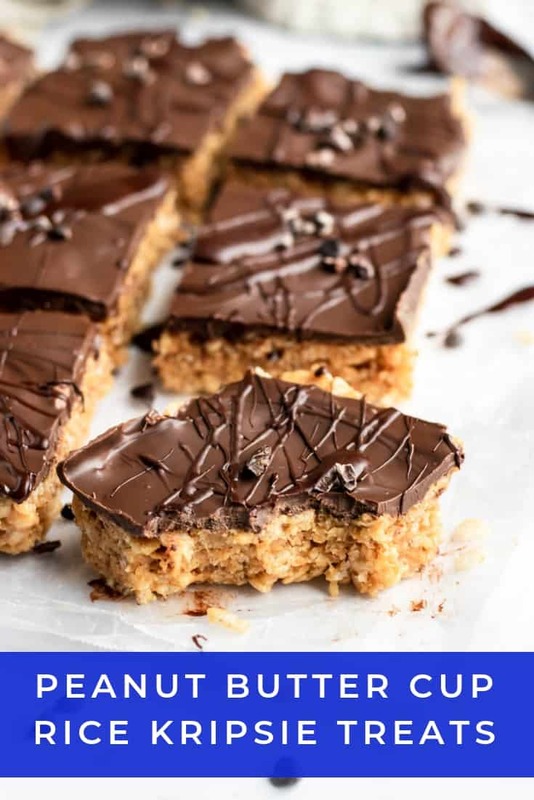 Peanut Butter Cup Rice Krispie Treats are a simple no bake treat that combine peanut butter and chocolate for a delicious dessert! 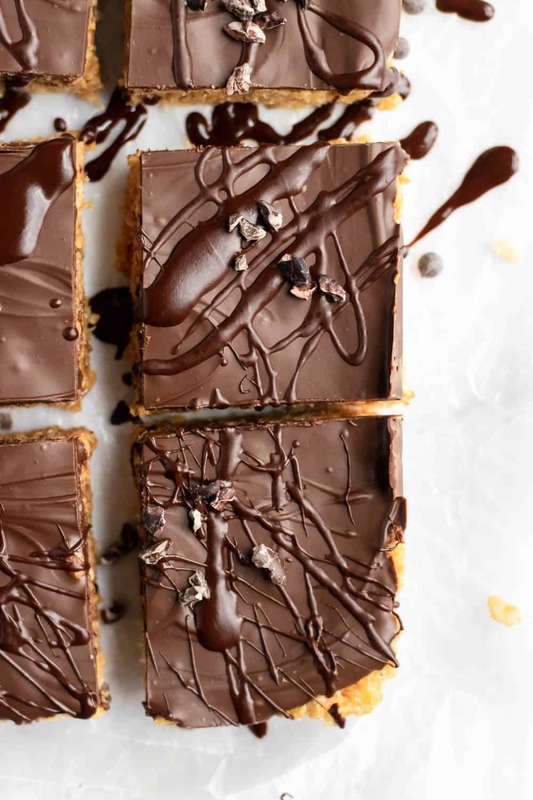 As a kid, ooey gooey Rice Krispie Treats were certainly a delicious treat. But what about when you are a grown up? Shouldn’t you get to enjoy this childhood favorite too? Of course! Sometimes I think I really should have named this blog Chocolate and Peanut Butter. I hope that this combination never gets old for you because it never gets old for me! 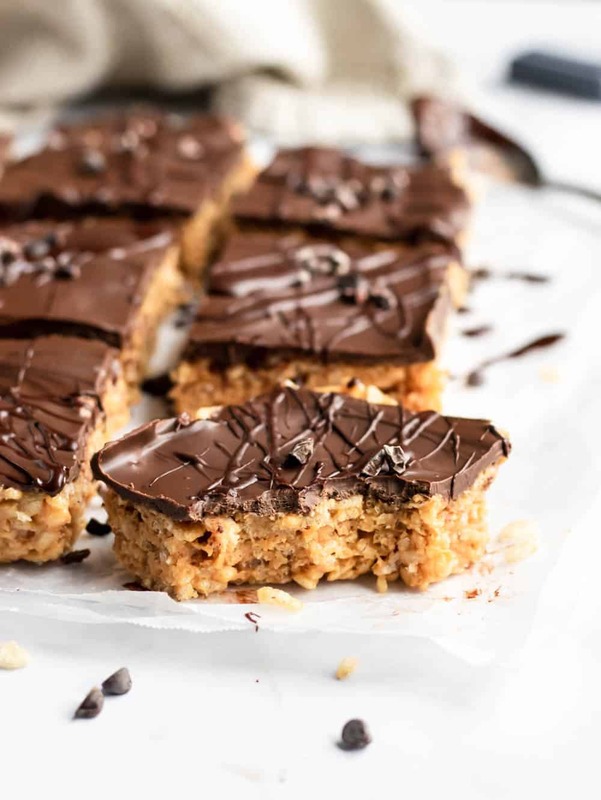 These Peanut Butter Cup Rice Krispie Treats give you the childhood nostalgia! Now that I have updated and photographed this recipe, I feel like the name Peanut Butter Cup Rice Krispie Treats may be a touch misleading. 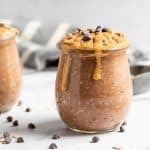 There definitely aren’t any Reese Cups in these–perhaps I will need to make that happen though. However, they have peanut butter and chocolate so I doubt anyone is really going to complain. 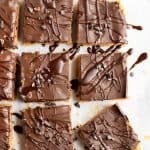 What I love about these treats is that I have everything in the pantry just about all the time to make them. Only 5 ingredients and all basics thats so many of us tend to have around the house! I always get way too excited when I actually have all of the ingredients for a recipe I want to make that I find on Pinterest or something. This one is exactly that for me. Plus, they take me back to my childhood. Food with memories, that’s always where it’s at. To be honest, you COULD skip the chocolate layer if you just wanted the peanut butter part. I have had them that way as well–I don’t find them to be quite as good, but they are still tasty as well! Love all things Rice Krispie treats? You will LOVE these Funfetti Rice Krispie Treat Pops too! In a small sauce pan, heat peanut butter, maple/honey, and vanilla over low heat until melted and combined evenly. Pour mixture into large mixing bowl and begin to pour in cereal a cup at a time and stir to evenly coat. Press mixture (press really hard!) into an 8x8 pan lined with parchment paper and allow to cool. 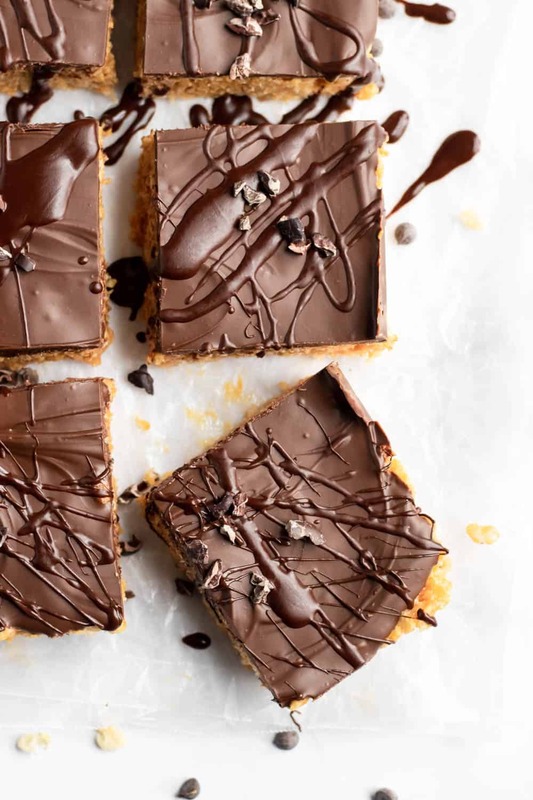 To make the chocolate coating, use a double boiler method. Fill a small sauce pan halfway with water, and bring the water to a boil. Place a glass bowl with chocolate chips on top. Stir constantly until smooth. 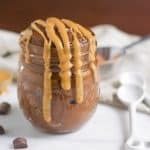 Pour chocolate coating over peanut butter mixture and spread evenly with a spatula. Just made these…awesome recipe!!! Haven’t had rice crispy treat since I became vegan, better than the marshmallow kind. Thank you! ? I agree! The marshmallow kind always left me feeling blah. Chocolate and peanut butter always do the trick. So glad you liked them and thanks for sharing! Does the maple syrup or the honey taste best? Trying to decide which to use! These used to be my hubby’s favorite bars and I have been wanting to find a healthier version, found it!! 😉 Thank you! Hi Allie! It’s really a matter of personal preference. I don’t really care for the flavor of honey so I typically use the maple. If you like honey better though, use that. Both should work really well in the recipe though. I hope your hubby likes them! I guess I didn’t press the rice mixture into the pan hard enough! They were tasty but the rice won’t hold together. I used almond butter and maple syrup. Yes, pressing very firmly was key for me. I made it once and that happened because I difibitely didn’t press hard enough. Were they dry at all? A bit more almond butter could help as well! Sorry they didn’t hold up for you!